Help! I Can't Find That Coupon! You have already figured out that couponing saves money, but now you need to know how to organize your coupons and save time. Having your coupons in order means more savings for you and less time searching. Take a few minutes to create a couponing strategy, and save more time and energy every week as you find the deals. 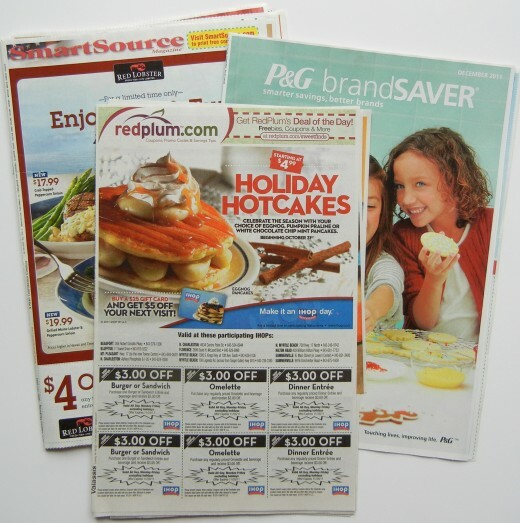 The are two basic strategies for keeping up with your coupons. Plan A is to clip coupons weekly from the newspaper flyers. This works if you have the extra time or you find weekly coupon clipping therapeutic (it really can be!). There is the risk of time wasted since you may clip coupons that you end up never using. The benefit is, once organized, you have every coupon you would ever need at your fingertips when shopping. Plan B is to keep all the coupon flyers intact and only clip when you are ready to use. You will need to date the flyers and find a drawer or binder to keep them. This plan works especially well if you use a coupon-matching website to find your deals. These websites direct you to certain coupon flyers by date, so you would be set up for that. The drawback is that it would be very cumbersome to carry all your coupon booklets with you to the store and then have to search through them all if you come across a possible deal. My personal couponing plan is actually a combination of the two. I browse the coupon flyers weekly and only clip the ones I know I will absolutely use. Then I store the flyers in a big binder that stays home in case I am directed to a good coupon match-up. As for coupons you print off the Internet, the same strategies exist. You can print the coupon as soon as you find it, or you can print it only right before you plan to use it. Printing all the coupons you come across could lead to wasted ink and paper, but then again, you will have the coupon in the event it becomes unavailable later. I print the ones that are for items I regularly buy, especially if it is a high dollar coupon. If a good match-up comes along, I go back and print the coupon later. The binder is crucial to keeping your coupons organized. You will need a thick sturdy binder that is going to stand up to some wear and tear. 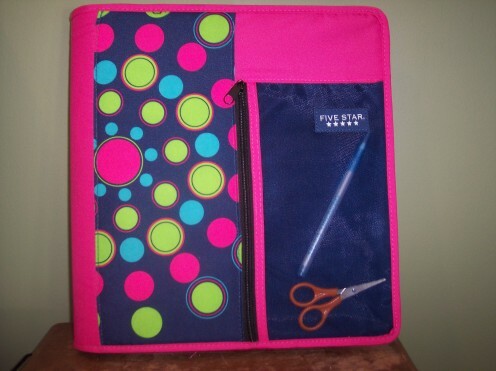 I purchased a colorful Five Star nylon binder that zips up and keeps my coupons secure. My binder also has some small zip-up pockets, which are good for scissors, pens, and a calculator. You will also need to purchase some baseball card sheet protectors - yes, baseball! These pockets are the perfect size for coupons. This will allow you to organize your coupons by subject. You can put like items together, or even organize by which aisle of the store the items will be found. For example, put coupons for cake/muffin mixes, spices, and oil together. 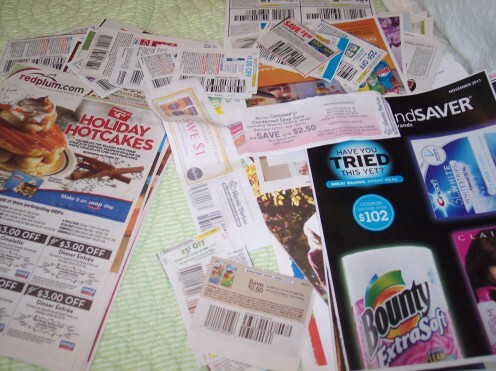 Even if you clip coupons only as needed, you will still need a binder for miscellaneous coupons you come across or coupons you receive from another source, like by mail, "peelies" on a product, "blinkies" from little machines in the store, mail flyers, etc. 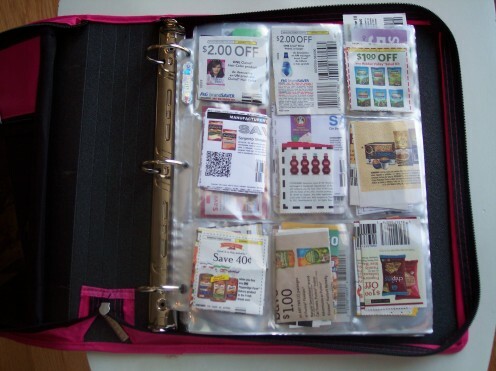 Once your coupons are organized, place a few empty protector sheets at the front of your binder. These you can fill with coupons you will use that day. For example, I may plan a trip to Publix and Harris Teeter one day. All my coupons for Publix will be placed on the first few sheets, and then the remaining sheets are for Harris Teeter. Some people may want to skip this step and just pull coupons as you go down each aisle, but I find that the first way cuts time. Once you have the item in your cart, you will want to pull the corresponding coupon and place it in an envelope or if you have a binder like mine, in one of the zip-up pockets. That way, you are prepared at the check-out lane and don't have to fumble over coupons. Remember, you can spend money to save time, or you can spend time to save money. Couponing is hard work, but the amount you save is such a payoff. Get your coupons in order and you will be more efficient and confident. Good luck! I also keep one folder for rebate offers I am working on and another folder for rebates I am awaiting a check. Kids love to help clip coupons - let them join the fun! Couponing: Is it Really Worth All the Hassle? Nicely written article and GREAT tips! One final word of advice for all the newbie couponers out there: PLEASE be organized BEFORE you step into the check-out line! There is nothing more maddening than waiting in line behind an unorganized couponer with piles of tattered coupons that may or may not be valid for purchases today. Verify expirations, applicable sizes, correct brands, etc. before getting into line. Also, it's disheartening for others to see that massive coupon notebook suddenly appear out of nowhwere, while the unsavvy couponer only NOW begins searching and pulling coupons. Please, by all that is holy, please be courteous to fellow shoppers! We want to inspire couponing by being thrifty AND fast. Then when the cashier announces our net total, the savings are jaw-dropping AND we didn't inconvenience 4 people in line behind us, we have been successful in ALL ways (and maybe inspired a fellow-shopper or two). Now if we could just get some help loading the car. Great Hub! It is alot of work but it feels sooo good to have the price come down at the end. I find that I will shift to a comparable product if the one I use isn't on sale or doesn't have coupons often. In NY I have found that competing markets will often take a coupon printed out from another store. That's an added bonus. Thanks for the binder clarification. I often see people in the store with them but I never saw the divided pages in school supplies. This will definitely help. Thank you all for your nice comments. The baseball plastic sleeves really help keeping the coupons in order. Amy, the website I use for matching coupons to store sales is southernsavers. They match all the stores in my area and it is very easy to use. Congrats on HOTD! Great ideas here. I have been using coupons for a long time, but never thought about using the baseball plastic sleeves. I'll do that now. I voted this UP, etc. I use coupons and like the tips here. Voted up! Great information. My wife should really read this. I bought her a binder but I know things could be much more organized than they already are. Congrats on Hub of the Day! This is excellent advice. Every so often I get the urge to pinch pennies and start couponing, but I just end up with lots of paper scraps floating around in my purse. Maybe if I used your organization tips, I could make couponing a habit! Great Hub. Thanks for the ideas. Voted up! Thanks for all of these couponing tips. I clip and clip and save. I do know that a notebook to keep them in would be a better way than the one I use so I will dust off one and get busy stashing. Congratulations on hub of the day..great job. I like this! I would also like to know more about how to find good coupon matches. I have been cutting them out! Good point. They would be so much easier left in tack! Thank you, everyone for your comments today! It is funny these days how many people are out there with the big coupon binder. Don't ever feel embarrassed - I even see them in the posh Harris Teeter stores in my fair port city. Saving money is chic today! Nice directions for a coupon binder!I don't use coupons very often. It seems the store brands around here are cheaper than what I have coupons for. Maybe I need to read your related articles!Congratulations on HOTD! Fantastic hub! I have been couponing with my binder for over a year now and it has slashed our monthly grocery bill in half. So happy to see you got hub of the day - congrats! Hello @chaplinspeaks. Thanks for sharing such a nice hub. I usually go to Google and find a coupon if i want something. but its a new website you have given me .I will use that for sure in future. Thanks for sharing. Terrific hub. I'm a Plan B-er myself. Thanks so much for posting... voted up and useful! Awesome hub! I've been trying to clip coupons for awhile and now that I'm getting married, I was wanting to try again. You have provided great tips and a new strategy that I am definitely going to try. Awesome job and congratulations on Hub of the Day Chaplin speaks!!!!! I do get coupons that I use but I found trying to clip and keep organized was not working for me. You've given me a strategy to try again. Awesome article!! Congrats on your Hub of the Day award! I am a fumbler with coupons and would benefit from your information. mobias - yes, a good motto to live by these days! "...you can spend money to save time, or you can spend time to save money." Not only a great and helpful hub I will share with my wife, but a great philosophy to rethink our lives! Some love the binder, some hate it. I took the plunge after missing too many spur of the moment deals. Really helps to have the binder - like the time Nice and Easy hair color was on super clearance at WalMart for $2 and I had $2 coupons! Great post! I am still new to supercouponing (I've written about my ordeals on HubPages)and am attempting to stay on top of my growing pile of coupons. A binder is certainly in order. I always fail when I attempt to use coupons because I either leave them at home or cannot find them in the stack of coupons thrown haphazardly into an envelope. Your binder with the baseball card dividers is the best coupon organizing method I have seen by far and I am going to give it a try. QC, you are so right with your words - "addict" and "coupon hunting". Couponing can be an obsession! Hey, I think you just gave me a new idea for another Hub! Thanks. Thank you, KeithTax. I am also a coupon freak and love it! I'm a coupon freak. Your hub is a great organizing guide for serious couponers. Thank you for your encouragement, vocalcoach! I still get bogged down with loose coupons sometimes, but try to find the time to put them where they belong before they expire! It really can be hard work. Did I ever need this! My coupons are all over the place. I never use half of them. You have really helped me out. Voted up and useful! A very good hub. Keep up the good work! Thank you, aemillervb and Frank A.! I also have used the ziplocs and envelopes which turned out to be a mess to search through. I even had envelope-size accordion folders, but they tore up so fast! !